Extending from the Arctic region in the north to the Antarctic region in the south, the Atlantic Ocean is second largest of the World’s oceans. Bounded by North and South America on its west and Europe and Africa on its East, and with an area of area of approximately 31.56 million sq mi (82 million sq km), not including the seas and bays surrounding it, the Atlantic Ocean makes up approximately one-fifth of the Earth’s surface. Approximately 250 million years ago, all of the continents we know today were combined into one large landmass called Pangae. When plates in the earth’s crust shift, it results in rifts being created between land masses. The Atlantic Ocean is thought to have developed when a rift between North America and Africa caused the land masses to drift apart, resulting in the Atlantic Ocean being created. The Mid-Atlantic Ridge is a submarine mountain range that extends north from Iceland to near the Antarctic Circle through the middle of the Atlantic. It separates the Atlantic Ocean into two large troughs each of which with a depth ranging from 12,100-18,000 ft (3,700-5,500 metres). 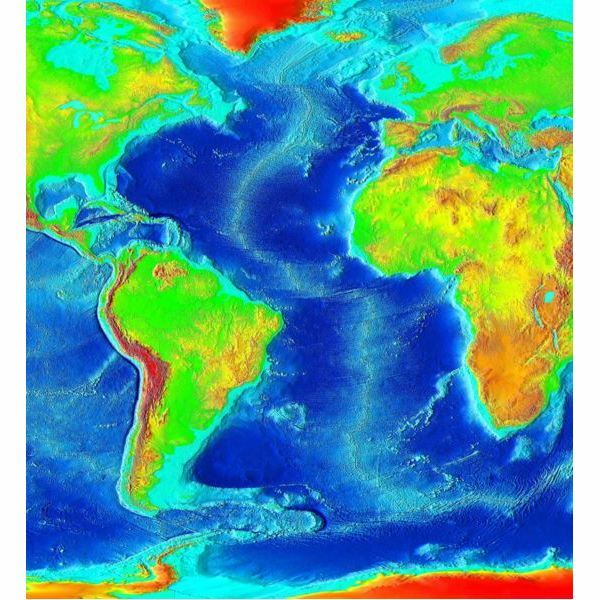 The ocean floor is thought to be mostly flat, but there are also a number of trenches, basins and canyons throughout, which cause the measured depth of the Atlantic Ocean to vary. Its greatest depth is on the Puerto Rico Trench, which is measured at 27,498 ft (8,381 m). How Do You Measure the Ocean? One of the original methods of measuring the depth of oceans was to lower a weighted rope or wire to the ocean floor to measure its depth. This method was extremely inaccurate, and was replaced with sonar in the 1930s. Active sonar is the method used to measure the depth of oceans and to study their topography. Both a sound transmitter and a receiver are used. The transmitter sends out a pulse of sound, which the receiver listens for the echo. Using a calculation that takes into account the speed of sound, the distance is measured by measuring how long it takes for the sound to “bounce" back. Many famous explorers traveled through the Atlantic Ocean and on to make some of the world's most important discoveries. In 1492, explorer Christopher Columbus sailed from Spain to the Caribbean islands. Between 1492 and 1504, Columbus made three other treks to the Caribbean and South America using the Atlantic as his route. Portuguese explorer Ferdinand Magellan also explored the Atlantic Ocean, traveling from Spain to South America. James Cook, a British explorer and astronomer, traveled the Atlantic extensively in his lifetime. With a diverse ecology, a rich history and covering approximately 20 percent of the Earth's surface, the Atlantic Ocean is a fascinating feature of the World and provides ongoing interest to the studies of geography, history and ecology.